The more we get to understand digital marketing and digital selling, the more complex it seems to become! But it keeps getting better. Wheres we used to be able to think about it solely in terms of channels such as SEO, Adwords or eMail, now we can see the benefits of not just focusing on, but automating the online sales process. We can also reap benefits from integrating our CRM system if it exists, and we are now getting increasingly demanding about what we wish to report against! Some Solution Assessment & Choices to Make! Inbound marketing software: there are many solutions available. A poor choice will over-complicate your solution, will become increasingly expensive as you evolve and may tie you in a proprietary way to a single vendor for years to come. Analytics & Reporting solution: as you develop your inbound marketing strategy, you will need reporting tools that will allow you to analyse and refine micro-level parts of your process. This is key. Failure to improve your process will prevent you from leveraging the infrastructure to maximum effect. Content production and distribution. You will most likely be using a CMS (Content Management System) for this. However, producing the right content is one challenge, how to optimise and distribute it is quite another. 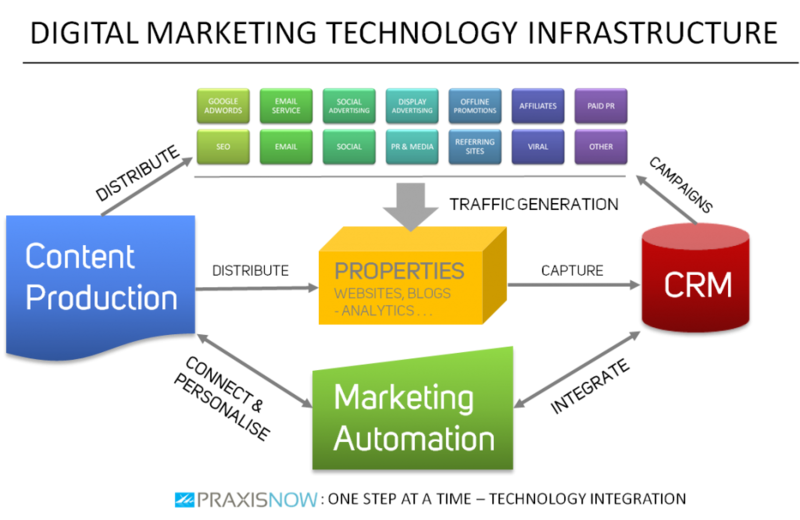 PraxisNow can work with you here during both the planning stage and the implementation stage. We can help you take the right decisions on the design of your solution, the software you choose and the processes you implement.